Sears Catalog Homes (sold under the Sears Modern Homes name) were catalog and kit houses sold primarily through mail order by Sears, Roebuck and Company, an American retailer. Sears reported that more than 70,000 of these homes were sold in North America between 1908 and 1940. More than 370 different home designs in a wide range of architectural styles and sizes were offered over the program's 33-year history. Sears homes can be found across the continental United States. While sold primarily to East Coast and Midwest states, Sears homes have been located as far south as Florida and as far west as California. Examples have also been found in Alaska. A handful of Sears homes have been identified in Canada. Sears Modern Homes offered the latest technology available to house buyers in the early part of the twentieth century. Central heating, indoor plumbing, and electricity were all new developments in house design that "Modern Homes" incorporated, although not all of the houses were designed with these conveniences. Primarily shipped via railroad boxcars, these kits included most of the materials needed to build a house. Once delivered, many of these houses were assembled by the new homeowner, relatives, friends and neighbors, in a fashion similar to the traditional barn-raisings of farming families. Other homeowners relied on local carpenters or contractors to assemble the houses. In some cases, Sears provided construction services to assemble the homes. Some builders and companies purchased homes directly from Sears to build as model homes, speculative homes or homes for customers or employees. Sears discontinued its Modern Homes catalog after 1940. A few years later, all sales records were destroyed during a corporate house cleaning. As only a small percentage of these homes were documented when built, finding these houses today often requires detailed research to properly identify them. Because the various kit home companies often copied plan elements or designs from each other, there are a number of catalog and kit models from different manufacturers that look similar or identical to models offered by Sears. Determining which company manufactured a particular catalog and kit home may require additional research to determine the origin of that home. National and regional competitors in the catalog and kit home market included Aladdin, Bennett, Gordon-Van Tine, Harris Brothers, Lewis, Pacific Ready Cut Homes, Sterling and Montgomery Ward (Wardway) Homes. In 1906, Frank W. Kushel, a Sears manager, was given responsibility for the catalog company's unwieldy, unprofitable building materials department. Sales were down, and there was excess inventory languishing in warehouses. He is credited with suggesting to Richard Sears that the company assemble kits of all the parts needed and sell entire houses through mail order. In the same year, the Aladdin Company of Bay City, Michigan, offered for sale the first kit homes through mail order. In 1908, Sears issued its first specialty catalog for houses, Book of Modern Homes and Building Plans, featuring 44 house styles ranging in price from US $360–$2,890. The first mail order for a Sears house was filled in 1908. As Sears mail-order catalogs were in millions of homes, Sears had a distinct advantage over many of its competitors as it was able to promote its "Modern Homes" plans to large numbers of prospective customers through its general merchandise catalog. As sales grew, Sears expanded its production, shipping and sales offices to locations across the US. To provide the materials needed for the Modern Homes division, Sears operated a lumber mill in Cairo, Illinois. Later, Sears constructed a second mill in Port Newark, New Jersey and purchased the Norwood Sash and Door Company in Norwood, Ohio. The ability to mass-produce the materials used in Sears homes reduced manufacturing costs, which allowed Sears to pass along the savings in lower prices for customers. Precut framing timbers, an innovation pioneered by Aladdin, was first offered by Sears in 1916. Precut lumber was cut to the appropriate lengths and angles based on where the framing timber would be used in the house. Prior to 1916, the prospective home builder had to cut their Sears-supplied lumber to appropriate lengths. These pre-1916 houses are not generally considered to be "kit houses" but do fall under the definition of a "catalog house". Construction of a house with pre-cut lumber reduced construction time by up to 40% according to Sears. Sears's use of "balloon style" framing systems did not require a team of skilled carpenters, as did previous methods. Balloon frames could be built faster and generally only required one carpenter. This system used precut timber of mostly standard sizes (2"x4" and 2"x8") for framing. Shipped by railroad boxcar, and then usually trucked to a home site, the average Sears Modern Home kit had approximately 25 tons of materials, with over 30,000 parts. Plumbing, electrical fixtures and heating systems were not included in the base price of the house but could be included, at an additional cost, with the house order. The Modern Homes features of central heating, indoor plumbing, and electrical wiring were the first steps for many families to modern HVAC systems, kitchens, and bathrooms. During the Modern Homes program, large quantities of asphalt shingles became available. Asphalt shingles were cheap to manufacture and ship, and easy and inexpensive to install. Sears also offered a plasterboard product similar to modern drywall as an alternative to the plaster and lath wall-building techniques which required skilled carpenters and plasterers. This product offered the advantages of low price, ease of installation, and added fire protection. Local building requirements sometimes dictated that certain elements of the house construction be done professionally and varied depending on where the house was constructed. Sears began offering financing plans around 1912. Early mortgage loans were typically for 5 – 15 years at 6% – 7% interest. Sales peaked in 1929, just before the Great Depression. While financing through Sears helped many homeowners purchase homes, the Great Depression led to rising payment defaults, resulting in increasing strain on the Modern Homes program. By 1934, Sears had stopped offering mortgages after the company was forced to liquidate $11 million in defaulted debt. Sears stopped selling homes for a short time in 1934 before restarting sales. Sales slowly recovered as the United States emerged from the Great Depression. 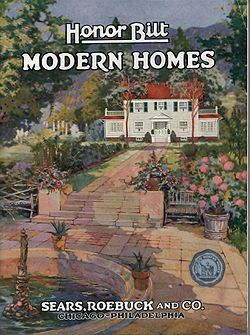 The last Sears Modern Homes catalog was issued in 1940. Although it is sometimes claimed that no Sears kit homes were built after 1940, Sears continued to offer pre-cut kit homes through 1941 and 1942. Many of these homes were based on models from the 1940 and earlier Sears catalogs but not all were, leading to debate over whether these homes qualify as "Sears Catalog Homes". Because these homes were constructed using pre-cut lumber and plans provided by Sears, these homes can be considered to be "Sears Catalog Homes". Many of these homes were built in Sears planned "Home Club Plan" developments in New Jersey, New York and Ohio. Homes were also built for industrial firms like Bethlehem Steel which purchased and constructed 61 Sears homes in Hellertown, Pennsylvania. Over the 32 years that Sears offered homes by catalog, Sears offered 370 different models. In the early years, the models were identified with numbers. After several years, Sears also began assigning names to the various models, a convention that carried through to the end of the program. Some models were offered with variations, the most common of those being expanded floor plans and additional finished living spaces. Sears houses could also be ordered with reversed floor plans. While the vast majority of models were for single-family house designs, Sears did offer a smaller number of duplex house designs and even a few larger multiple-family buildings. Certain models were more popular than others and the most popular models were offered over multiple years. Other models were only offered for one year and some models that were offered have yet to be identified as ever having been actually built. Some models were offered in both wood siding and brick veneer versions with different names attributed to the same or almost identical home plan. The models listed below are some of the most popular models. 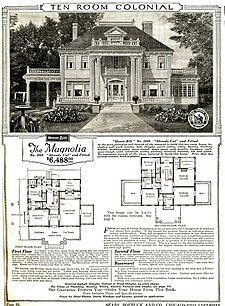 The largest and one of the most expensive Sears models was the Magnolia. Only seven Magnolias are known to be still standing. One Magnolia built in Lincoln, Nebraska was demolished. Sears Homes have become increasingly popular among history enthusiasts because of their sturdy structure, the do-it-yourself nature of construction and the popular architectural design concepts. However, many houses described as Sears Homes are not true Sears Homes, being either the product of another kit home manufacturer or not a kit home at all. Sears houses can be identified and/or authenticated using the following methods. Sears Catalog homes were only offered between 1908 and 1942. Any homes built before 1908, or after 1942, cannot be a Sears Catalog home. However, there is some debate about whether some homes from Sears that were built in 1941 and 1942 qualify as Sears Catalog homes. Some of these homes were based on models offered in the Sears Modern Homes catalog. Others were not but were still pre-cut kit homes from Sears. Original paperwork for the house including blueprints and letters of correspondence from Sears. Cities that have records of building permits may list Sears Roebuck as the original architect. Also, homes in southern Ohio may have financing documents through the "Norwood Sash and Door Company" of Norwood, Ohio. Shipping labels: Often found on the back of millwork like baseboard molding or door and window trim, shipping labels associated with Sears may indicate that the home is a Sears Catalog house. Most of the millwork was fulfilled by the Sears-owned "Norwood Sash and Door Company" of Cincinnati, Ohio. However, building materials like millwork could be purchased separately from Sears so millwork with shipping labels is not, by itself, a definitive indicator of a Sears Catalog house. Stamped lumber: Most easily found in unfinished spaces like a basement or attic, framing members were stamped with a letter and a number. These stamps are normally located on or near the ends of pieces of framing timber. However, these stamps were not used on lumber shipped before 1916, when Sears first started offering pre-cut lumber. Compare house designs to original catalog images. Some models of Sears homes were very similar in design to models offered by other kit home manufacturers or through plan books. Designs may have been modified but generally should match in layout and dimensions. Sears Catalog homes built in the 1930s may have a small circled "SR" cast into the bathtub in the lower corner (furthest from the tub spout and near the floor) and on the underside of the kitchen or bathroom sink. Goodwall sheet plaster was an early drywall-like product offered by Sears and may be an indication of a Sears Catalog house. Carlinville, Illinois with 149 in the Standard Addition neighborhood as well as several other Sears houses elsewhere in the city. Carlinville is said to have "the highest concentration of contiguous Sears homes in the nation." Massapequa Park, New York: Several dozen houses were built in the 1920s and 1930s. The largest number were built on Grand Boulevard. 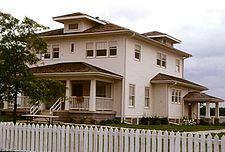 The Carlinville, Illinois concentration consists of houses bought in bulk by the Standard Oil Company in 1918 to house its mineworkers at a total cost of approximately US $1 million. The houses, comprising eight different models, were all built in a 12-block area known as the Standard Addition. Building of the houses took nine months which were completed in 1919. The bulk order is the largest known order for Sears Modern Homes and led to Sears, Roebuck naming their "Carlin" model after the city. Not all Sears houses became private residences. 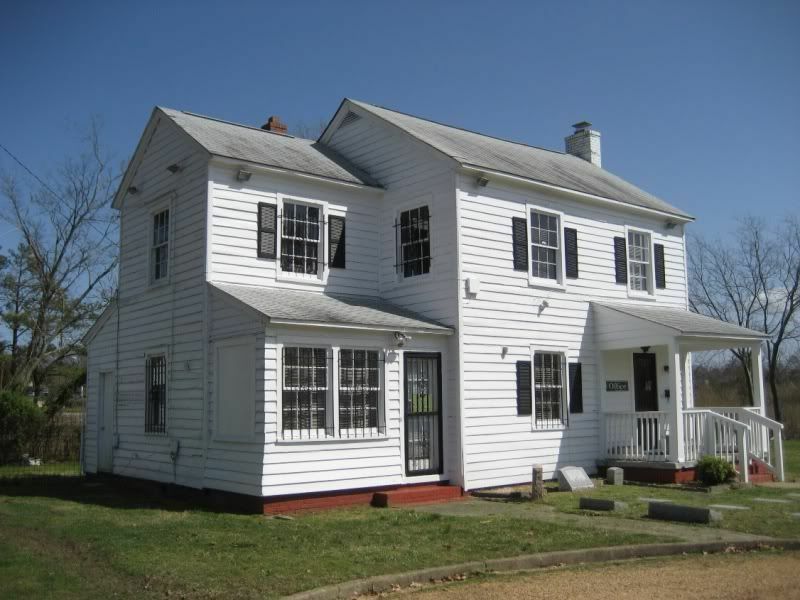 At Greenlawn Cemetery, near the Hampton Roads waterfront in the Newport News, Virginia, area, the cemetery office building is a 1936 Sears Catalog Home. Rock House inhabited by Laura Ingalls Wilder, Mansfield, MO. According to Carolyn Fraser's Pulitzer-winning book, Prairie Fires: The American Dreams of Laura Ingalls Wilder, the house that Rose Wilder Lane built for her parents, Laura Ingalls Wilder and Almanzo Wilder, at Rocky Ridge Farm in Missouri was from a Sears kit. The kit was greatly modified by Lane's ambitious designs. Her parents did not care much for the house and eventually moved back into their original farmhouse. There are examples of modern homes built based on the design of Sears Catalog homes. In some cases, homeowners used plans from original Sears Catalog homes to recreate a modern version of a Sears home. In other cases, the home followed the general design of a Sears house without being an exact duplicate. One well-known replica of a Sears catalog house is at the "Farm at Prophetstown" museum in Battle Ground, Indiana, which features a replica of a Hillrose model. The house forms part of the farmstead at the museum. ^ "Sears Archives". Retrieved 2012-12-31. ^ "Did Sears, Roebuck Sell Homes in Canada?". Retrieved 2015-10-21. ^ "Sears mail order homes". Retrieved 2011-11-30. ^ ""Bill of Materials for Sears Modern Home"". Retrieved 24 September 2017. ^ "Two Italian Families and their Neighboring Sears Houses". Retrieved 2015-02-17. ^ "New Homes in Cranford for $4,000!" (PDF). Cranford Chronicle. 1992-07-09. Retrieved 2013-11-09. ^ "New Homes in Cranford for $4,000!Biggest development evolved in Sunny Acres" (PDF). Cranford Chronicle. 1983-04-07. Retrieved 2013-11-09. ^ "Yes, Virginia, Sears Homes Were Built After 1940". Sears Homes of Chicagoland. 2012-11-25. Retrieved 2013-11-09. ^ "The Top Four Most Popular Sears Homes--Have You Seen These?". Sears Homes of Chicagoland. 2012-07-21. Retrieved 2013-10-13. ^ Thornton, Rosemary (2012-11-27). "How to Properly Identify a Sears Magnolia". Sears Modern Homes. Retrieved 2013-10-13. ^ Thornton, Rosemary (2013-08-29). "Eight Pretty Maggies in a Row". Sears Modern Homes. Retrieved 2013-10-13. ^ "Sears Homes in Hopewell". Retrieved 2012-12-31. ^ "The Sears Home Leaderboard". Retrieved 2018-08-20. ^ "Tour of Sears kit homes in Aurora" (PDF). Retrieved 24 September 2017. ^ Holliday, Art (28 April 2017). "How Sears built an entire local neighborhood". KSDK Channel 5. Retrieved 30 October 2017. ^ "Sears homes in Cincinnati, Ohio". Retrieved 2014-05-20. ^ "Sears Catalogue Homes". drive.google.com. Retrieved 2017-02-27. ^ "Sears Houses in Elgin Illinois arranged according to model name". Illinois Digital Archives. Retrieved 27 December 2017. ^ "The Sears Home Leaderboard". Retrieved 20 August 2018. ^ "Sears Houses of Massapequa Park, New York". Kit House Hunters. 25 October 2015. Retrieved 11 November 2018. ^ P-D, Joe Holleman •. "Sears home". Retrieved 24 September 2017. ^ "Cemetery Office in Newport News". Retrieved 2012-12-31. ^ "Hogue House in Chelsea, Oklahoma". Retrieved 2013-06-08. ^ Fraser, Carolyn. Prairie Fires: The American Dreams of Laura Ingalls Wilder. Henry Holt and Co., 1917. ^ Solonickne, Lara. "A New Sears Avalon in Wisconsin". www.sears-homes.com. Retrieved 24 September 2017. ^ Solonickne, Lara. "A Sears Kilbourne--Built in 2004". www.sears-homes.com. Retrieved 24 September 2017. ^ "Farmstead – Farm at Prophetstown". prophetstown.org. Retrieved 24 September 2017. 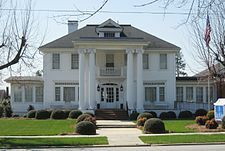 Wikimedia Commons has media related to Sears Modern Homes. Bryant, Kathy (1995-05-06). "Made to Order: Many American Dreams Came Out of the Sears Catalog, Including Do-It-Yourself Houses". Los Angeles Times. Archived from the original on 2008-10-03. Retrieved 2013-10-14. Groer, Annie (2002-02-07). "The Whole Kit and Caboodle". The Washington Post. Archived from the original on 2009-10-25. Retrieved 2013-10-14. Leavenworth, Jesse (2001-03-18). "Yesterday's kit houses are today's sought-after properties". South Coast Today (Connecticut). Retrieved 2013-10-14. Maxwell, Shirley; Massey, James C. (July 2002). "The Story on Sears: Houses by rail and mail". The Old-House Journal. Retrieved 2013-10-14. Wright, Gloria (2011-05-28). "Syracuse house, which came from a Sears catalog, is one of only seven of its kind in U.S." The Post-Standard. Retrieved 2013-10-14. "Sears Homes". Classic Rock Face Block. March 15, 2016. Retrieved April 11, 2017.